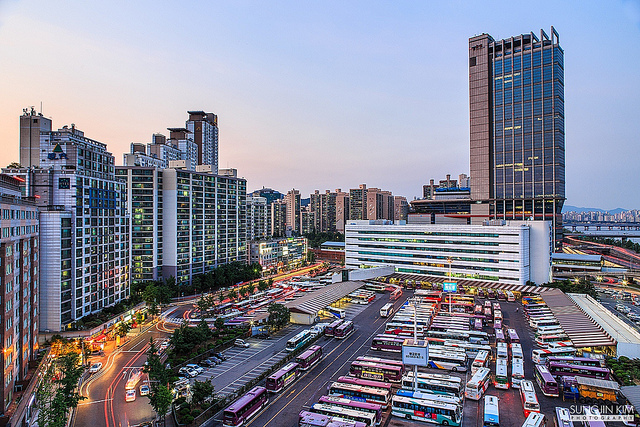 Dong Seoul Bus Terminal is in Seoul that manages buses operating throughout South Korea including buses traveling to Gyeonggi-do, Gangwon-do, Gyeongsang-do, Chungcheong-do, and Jeollanamdo (provinces). It is located in front of Gangbyeon Station, Subway Line 2, Exit 4. You can reserve bus tickets through their official website or your mobile app. Alternately, purchase your ticket right at the Ticket Window at the bus terminal. You may download any of the two map apps for you to conveniently navigate your direction. You can visit Play Google to download any of those maps for your guide travel to Dong Seoul Bus Terminal. Of course, you can definitely use the maps to navigate all corners in Korea using the fastest routes including directions to hot restaurants, attractive sites, and more! You may purchase a bus ticket using a Credit Card or Cash. Location: Gangbyeon Station (Seoul Subway Line 2), Exit 4. Dong Seoul Bus Terminal is operated by Dong Seoul Terminal Operations Corp which is owned by Hanjin Company. The terminal was built in 1987 but started operating in 1990. Soldiers use this terminal for their trips to Gangwon Province which is coded 032 including Jeolla Province; which buses going to Chungcheong, and Gyeongsang Provinces are coded 031. This terminal was established to serve the newly-constructed Jungbu Expressway. Since the following are estimates, please ensure that you have available time and resources in case you need to be at your destination at a specific time. For more details and other destinations, please feel FREE to explore this useful website for destinations and fare rates: www.rome2rio.com. While waiting for your travel schedule, you can spend some time at two places nearby the terminal. This property is a hot spring, bath house, spa, and jjimjilbal where you can relax. It is actually a sports club and hot bath/spa complex which is situated in Gwangjin-gu close to the terminal. In particular, Happy Day offers a fitness club, golf facilities, a sauna, and hot bath facilities. Riverside Spa Land is also located nearby Dong Seoul Bus Terminal. Similar to the one mentioned above, this is also a bathhouse. However, its services are more of a traditional Korean sauna. You can pamper yourself and enjoy Korea's best foot massage for free. Now, in case you are looking for a room to stay for some reasons before or after your travel, you can avail hotels nearby. One of the hotels is below. This is a boutique hotel located near to the terminal at Gangbyeon Station, Subway Line 2. You can make use of their themed guestrooms furnished with comfortable facilities. They have a restaurant, banquet room, theater, among other conveniences. The guestrooms available are Western-style, Korean-style, and suites. They have over a hundred rooms for you to choose from. Techno Mart is a shopping mall where you can purchase most of the items you can think of. Among them, you can shop any electronic item or appliance of the estimated 2,000 items. These items can be found from the 2nd to the 8th Floor. If you cannot find what you are looking for, you can just cross to another shopping centers which are linked with Techno Mart itself. Lotte Mart is considered a discount shop which also sells various products include food and drinks. It is said the Lotte Mart of Gangbyeon is the first Lotte Mart supermarket built in the country. You can easily find it inside Techno Mart itself. Movie houses and other entertainment facilities are inside Techno Mart. If you find this page useful, please don’t hesitate to share with your friends or family members. Hope you have an enjoyable and safe travel.